Making a change to your job is now easier than ever. Whether you want to talk to your Producer directly, ask for an update, or change the time of your delivery, we've got you covered. You'll notice that we have replaced the comment box with two shiny new buttons. These are designed to provide you with an even better 90 Seconds experience, helping our Producers prioritise tasks and resolve requests faster. Simply hit 'Make a Request' and use the pre-loaded form to let us know exactly what you want to change. Giving us all the information up front means we can action your requests in lightning speed. 2. Once submitted, the request will remain active on your project page until resolved. 3. 'View Full Request' to chat directly with your Producer in a private comment feed. Once resolved, the request will disappear and your activity feed will remain clean and clear, reserved only for the most important of updates! 4. 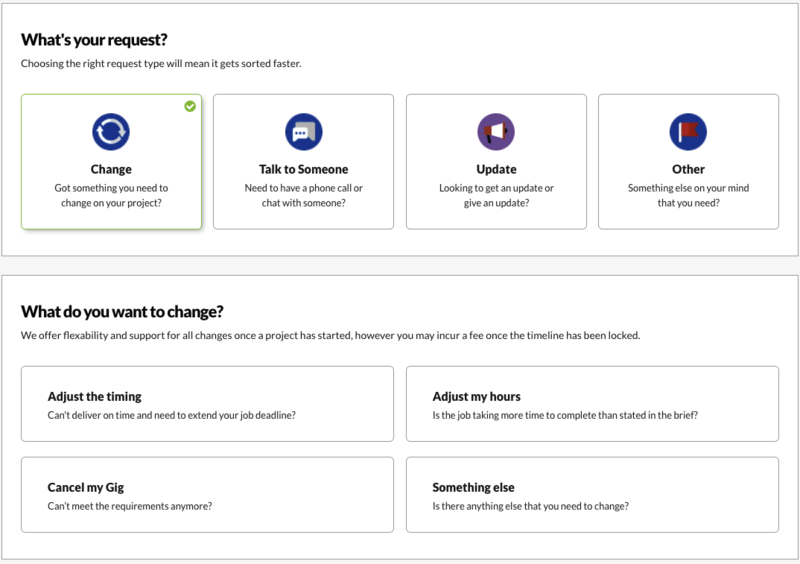 If you simply want to chat with your project team and don't necessarily need your Producer to action anything in particular, clicking 'Give an Update' will unlock the original comment box we all know and love. Remember, comments provided here will be seen by the entire team whereas Requests open a direct conversation with your Producer. Check out our handy walkthrough guide of the Make a Request feature right here.